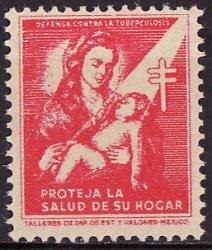 Mexico 1.1, 1943 Mexico TB Charity Seal, Type 1, full gum. 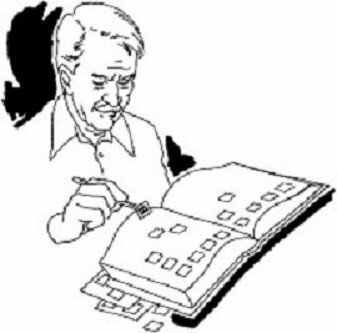 F, MNH. Issued 1943 by the Comite Nacional de Lucha contra la Tuberculosis. Printed on watermarked postal paper. Mexico 1.1, 1943 Mexico TB Charity Seal, F, MNH. Seal is printed on water marked postal paper, full gum. Scan of front and back available upon request. Issued 1943 by the Comite Nacional de Lucha contra la Tuberculosis. Mother with child in her arms, with double bar cross in upper right; "Defensa contra la tuberculosis" at top; "Proteja la salud de su hogar" at the bottom. Color: red; seal size: 171/2x22; perf. 14,; full gum. There are two (2) types of this, the first Mexican TB Seal. This is Type 1, which has a single frame line with the name of the printer below the frame line. TB Charity Seals are also known as Christmas Seals, and are usually classified as Charity Seals, or Cinderella Stamps.